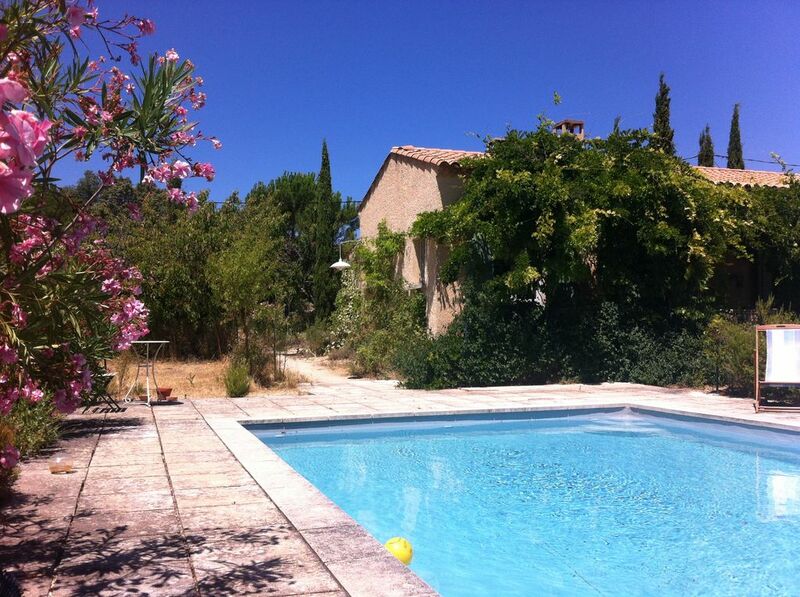 House in the Luberon Park with private pool. Nice house, double living room, large kitchen, three bedrooms, 2 bathrooms, large shaded terrace adjoining the house. With its beautiful view overlooking the Monts du Luberon, this house of 100 m² is located near the hamlet "Cliers", in the Regional Natural Park of Luberon. private pool 10 x 5 meters. Garden furniture. The house is completed by a shaded terrace with barbecue over 25 M.
The vast garden (6,000 m²) is full of Provencal plants, cypresses, olive trees, fruit trees, Mediterranean species, aromatic plants, rosemary, oleander etc. The house accessible for wheelchair has a large fully equipped kitchen, a living / dining room, 3 bedrooms and 2 bathrooms (one with shower and one with bath). Three bedrooms: 1 double bedroom, 1 bedroom with 2 single beds and 1 bedroom with twin beds. Baby bed. shady place to park 2 cars. The house is located in the Luberon near Roussillon (6 km) and Gordes (11 km), villages classified among the most beautiful in France. Discover this beautiful area during your stay! In the town of Apt located a few kilometers, you will find a very large market (Saturday morning), all shops and several supermarkets. The TGV train station and Avignon airport are 50 km away. Rentals only from Saturday to Saturday (except low season). Before leaving the weekend of August 4 the period from July 28 to August 11, 2018 is available only for the fortnight. Please do not ask me from August 4th to 11th or from July 28th to August 4th. La casa di Francois è spaziosa, fresca, con una cucina ben attrezzata. Francois il proprietario è una persona accogliente e gentile che parla molto bene anche in italiano con cui è stato interessante scambiare conoscenze e opinioni. La piscina è inserita in un vasto giardino fiorito. Siamo stati una settimana, ma saremmo rimasti lì per mesi. Bref , cette maison est parfaite pour des vaçances réussies! Private pool and garden. Plenty of space inside and out. Well equipped kitchen with big fridge/freezer. We would definitely go again! "Maison très agréable avec une vue magnifique sur le Lubéron, jardin vaste et plein de plantes provençales, proche des principaux lieux de visites, un excellent séjour à recommander, très calme." "Maison bien équipée, très agréable à vivre, avec sa grande terrasse couverte, dans un environnement magnifique et calme.Point de départ idéal pour visiter cette belle région. A refaire sans aucune hésitation!"